Today, instead of discussing marketing ideas in general terms, I will provide a specific example. I think this will be quite useful. This post features a specific nonfiction book, which has many instructive marketability features, and its author, who has done some wonderful things in the way of marketing which are accessible to most authors. The e-book is currently number #1 in Happiness at Amazon, and was in the top 1000 in paid books in the Kindle store when I checked on it last night. This is a result of the book’s marketability combined with the author’s marketing. I will try to reveal many of the instructive features that have made this book successful, with the hope that doing so may help other authors. I plan to do a future post on a fiction book, too. I also have one in mind that features a specific website with instructive marketing and publicity features. If these work out well, I’ll consider preparing posts like these more often. I recommend checking out the paperback edition on Amazon. Explore the book’s detail page and the Look Inside. There are specific features that help its marketability. I’ll refer to these; if you see them for yourself, it will be more instructive. The Kindle edition has the much better sales rank presently, but the paperback edition has some nice formatting that I’ll mention in a moment. What makes this book so marketable? The concept: Who doesn’t want to be happier? It’s a hot commodity. 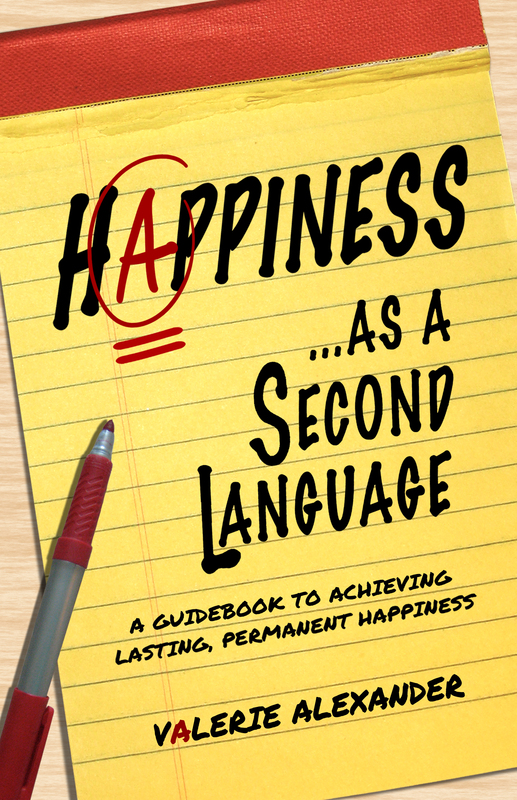 But it’s not just happiness: It is teaching happiness like it’s a foreign language (which correlates with experience). Cover appeal: (1) Yellow is a happy color, which fits the theme. I like the ‘A,’ because it sends out good vibes. I feel happy just looking at it. (2) Three color rule: Mostly yellow, contrasting with black and red nicely. (3) Easily readable, yet the font is interesting and seems to fit the theme. A large title is common in nonfiction. (4) Grabs the attention of the target audience quickly. (5) Simple yet effective. Didn’t make the mistake of being too busy. Effective blurb: It’s concise and clear. It comes right out with the best stuff. What’s really nice is that it presents ideas that seem foreign, so you feel like there is a lot of material you can learn, but it also makes everything seem like it might be easy to understand (“happy colors” isn’t technical jargon, but sounds easy to learn and apply). Formatted blurb: Note the occasional use of boldface and italics, which can be done through AuthorCentral. Emotion: Check out Valerie’s bio. She experienced life’s challenges and overcame them with the techniques that she explains in her book. It’s a moving success story. Notice that she just briefly mentioned her low point in her bio, instead of going into detail her. Wise decision, I think. Smile: Her author pic shows a nice smile, which it must, because she’s selling happiness. The photo is appealing, which is important. Professional Look Inside: This is very important. Once the cover and blurb entice the reader, the Look Inside has to close the deal. The copyright page shows that it was published by Goalkeeper Media, Inc. Look at the bottom of the copyright page where it lists people who took the author photo, designed the cover, did the cover layout, and designed the interior; you’ll find similar information in many traditionally published books. Design marks: The design marks on the first page of each chapter and the page headers look professional (I’m referring to the paperback edition). Note that the page header marks are light so as not to call too much attention from the reader (and distract from the reading). If you can find any of the tables or textboxes, they are well-formatted, too (maybe try searching for “Pop Quiz” in the Search Inside feature). Professional touches make a big difference. Editorial reviews: A few of these on your book’s detail page can be helpful. The book looks professional from cover to cover. This is so important. Combine this with content that appeals to a large target audience a book will have amazing potential. That’s what readers want. They want books that appear professional from cover to cover and on the product page, where both the content and packaging appeal to them. Isn’t that what you want when you’re shopping for a book? What did the author do to market this book? Note that these are all observations that I have made on my own. I did contact Valerie to get her consent before preparing this post, but I have based everything on my own observations. Like just about everyone else reading this post, Valerie has a blog. I checked out her Speak Happiness blog and the archives date back to January, 2013. I checked her Kindle and paperback product pages, and her publication date is April 30, 2013. Therefore, I see that she started building an online following and creating buzz for her book 3-4 months before she actually published it. Premarketing is very important. You can see from her blog site that she—like many authors—is also active on Twitter and Facebook. Her headers are effective, too. They help to brand an image from her cover. She doesn’t just have the social media going, she’s also an active and supportive member of the community. I know this firsthand from my occasional interactions with her on both of our blogs. Creativity can be put to good use in marketing. Check out the Reader Gallery on her blog site. You see pictures of readers holding her book up. This was a clever idea, and Valerie succeeded in getting participation. One of the best things, in my humble opinion, that Valerie has done in the way of marketing is to get visibility among her target audience in high-traffic areas. This can be huge. She achieved this by publishing articles that relate to her book’s content. This is a very valuable resource that most authors don’t bother with. There are so many places online and offline that need relevant content that it gives you a chance to succeed in getting an article published and mentioning next to your name, Author of My Book Title. Valerie published multiple articles with the Huffington Post. You can’t do it if you don’t try. Valerie tried and succeeded, and it greatly helps with exposure. You can create the perception of value. First, the price itself helps to establish this. Next, personal interactions with your target audience add value to your book. If you’re providing quality service like this and you have a marketable book, you don’t have to price at the low end of the spectrum. Also note that a higher price may actually help your sales rank if you can succeed in generating sales at the higher price. If a 99-cent e-book sells 100 copies per day, a $5.99 e-book that sells 50 copies per day actually makes more profit for Amazon. So Amazon should (for Amazon’s own benefit), and seems to, factor price into sales rank. Valerie is just doing one huge promotion this October, and after that her e-book will be permanently priced at $4.99 (a discount off the original price, but nothing like 99 cents). I’m fond of this strategy. She went all-out to promote the daylights out of her book’s sale. She makes it very clear that it’s a one-time deal, which provides a sense of urgency. After the sale, nobody will be thinking to wait until the next sale. I really like that she isn’t giving her book away for free, yet she is making highly effective use of a one-time sale. She’s getting ample exposure while still drawing royalties. Unlike freebies, since people are paying for the book, they’re probably actually reading the blurb to make sure it’s something they want and they are more likely to actually read the book once they buy it. There are a couple of marketing tools that Valerie has used, which many authors don’t. One is a book trailer and another is an audiobook (there is a significant market for audiobooks, especially among truck drivers; if your target audience is in this market, it may be helpful to do). An important note about Valerie’s book trailer is that she shot the video on her iPhone. You don’t need access to a professional movie studio to do this. If you need a little help, try contacting the film department at the nearest university. There is a good chance that a film student would be interested in earning a little income to help you out. When I showed Valerie a draft of this post, she mentioned that she sees her shortcomings more than what she may be doing right and compares herself to other authors who seem to be doing everything right. If you feel this way, as many authors do, there is something you can take from this. Even authors who seem to have achieved various degrees of success struggle with doubts, find faults in themselves, and see greener grass on the other side. In a way, this can be good and help to keep you humble. It may be helpful to other authors to realize that even successful authors experience these same issues. I hope you got something useful out of this article. In the past, I haven’t done interviews or book reviews. This is as close as I’ve come. I feel like I’m providing useful marketing content while also helping another author at the same time. Please let me know how you feel about this, as feedback will help me decide whether or not to try it again in the future. Let’s offer a big THANK YOU to Valerie for allowing me to feature her book in my post. Thank you Chris and Valerie. It is good to see an effective strategy that doesn’t necessarily involved giving the book away. I have always felt that the indie author market ceiling is a bit low. I know it has to be somewhat lower than traditional, (or does it, are we just too anxious?) to stay competitive, but I cringe every time my husband spends $12 for an ebook, when mine is listed at $3.99. I think anxiousness is a big factor, along with the belief that a lower price will drive more sales (without realizing that more people believe that you get what you pay for, and have some experience with this). So many big publishers price their ebooks above $10 it leaves the door wide open for indies to thrive in the $4 to $6 dollar range—what a great value by comparison. If a bestselling author’s ebook is over $10, usually you can buy the hardcopy used for less if you just wait long enough; if they’d come down on their ebooks, I would prefer that to buying used, but I guess they don’t take this into consideration. In contrast, the indie ebook price is usually affordable, so the thought of buying a used paperback to save money isn’t a factor (besides, indies need all the support they can get, so I would buy new anyway). Your post added a lot of value to Valerie’s book – by making it ALSO an example of how to publish and market effectively. I popped over and bought it based on your recommendation – I’ll remember this post when I’m starting to look into marketing. I am looking forward to you doing this for a book of fiction – I’m extra curious at which genre you will pick to do your analysis. When I’ve finished Pride’s Children, and can publish, I have a long list of things for my marketing plan. I see a lot of advice for genre fiction, especially from self-publishers, but not so much for contemporary/commercial/mainstream novels (hint, hint). I think being smart about every little thing a writer can learn when writing and marketing will add up to success – depending on the book’s potential audience. It is hard to pick among all the alternatives – which social media, advertising, promotion – and some day soon it will be necessary. Half my time now seems to be spent learning! The fiction piece I had in mind is for genre fiction. Marketing contemporary or literary fiction can be more challenging, so I can see how that may be helpful. This will also challenge me to try to find an instructive example; that may take some time. Speaking of time, it may be a few weeks before the fiction piece is ready. I’m sure Valerie will appreciate your support, and I hope you’ll find her book as helpful as I have. I appreciate all of the support — yours especially, Chris! Thank you so much for this lovely post. Also, I’m happy to answer any questions your readers may have. If you post here, I’ll reply asap. If you’d prefer to ask privately, feel free to email me. Valerie@SpeakHappiness.com. Very interesting, Chris, I look forward to your fiction feature also. Thank you for letting me know. 🙂 It may be a few weeks, though, since if possible I’d like to time the post to match an upcoming promotion that the author has planned. I’ll keep my eyes peeled…Ouch, always sounds so violent that phrase..I’ll look out for it!